In addition to several horrible dreams, that I won’t tell you about, I had one recently that was basically living in an episode of Doctor Who. It was the second Doctor though. The plot was really similar to The War Games, except it took place in random settings, like stores. It was cool interacting with Doctor 2 though. I just barely remember it now. Parts were in black & white too. I appreciate the support, and the metaphor. 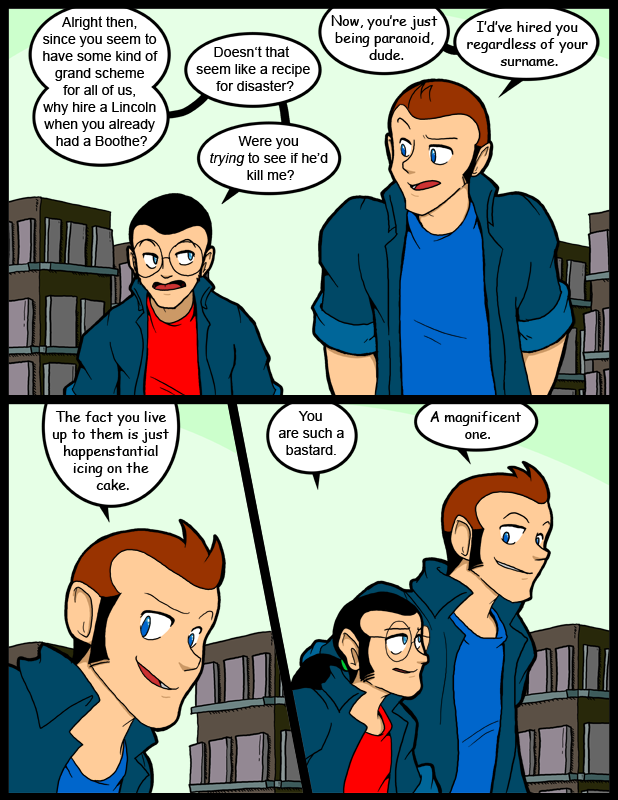 I started reading this webcomic this morning… Along the way I laughed (a lot), I thought, I pondered, and I genuinely came to like the characters. Then, I reached the end… My sadness cannot be conveyed through words. Glad you enjoyed yourself, sorry I can’t make it faster. XD I hope you’ll keep visiting me from time to time, and tell a friend. Am I missing something? The last comic was 616 and this is 618? I explained it in the blog. They got posted out of order and now I can’t decide which order I like better. Not 100% on that, since John Wilkes Booth’s name was spelled… well, just like that, without an ‘e’ on the end of Booth. It’s possible, I suppose… not to mention, the characters have heard the names, but not spelled them out (that I’m aware of), so they wouldn’t necessarily notice. Regardless of whether they are related to Abe Lincoln and J. Wilkes Booth, respectively, I’m glad that the characters themselves noticed the last name thing.